Crowns work to restore teeth by fitting over the remaining part of the tooth, making it strong and giving it the shape and the contour of a natural tooth this way improving its appearance, shape or alignment. This particular dental restoration entirely covers the visible side of a tooth fully restoring its look and function. This is an ideal solution for broken or decayed teeth. When there isn’t enough tooth remaining due to a large filling. 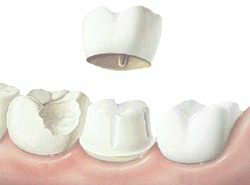 Use a tooth as an abutment to attach a bridge. For cases like these, a crown is the most logical option, plus it is made not to be noticeable by matching it in size and color to other teeth.